The previous three months had been extremely hectic, with no opportunity to get out for a hike, so when the upcoming weekend looked like it might be free, I made plans to go. The winter up to then had been unusually warm, with only a token amount of snowfall. As it happened, this was to be Winter Weekend, so I signed up to stay with the club at Alpine Inn. As the weekend approached, the TV started predicting the "Storm of 2005" on its way, with massive amounts of snow, frigid temperatures, and blizzard conditions. They urged everyone to stay indoors. Of course I could not be deterred. When I got to the Alpine Inn it was deserted. I got checked in to my room, and almost froze my hands off just carrying my backpack from the car to the room. It was COLD ! I put on all the clothing I had brought (more than I had ever worn in my life) and took a walk down to the bottom of the hill, to see if I could survive outdoors. Other than freezing my face, I was OK, at least for a few minutes at a time. The next morning I was up early for breakfast, anxious to get out before the snowstorm, which was predicted to start around noon. I was the first one up, but eventually a few other club members began to wander over. The restaurant was operating on a leisurely schedule, and by the time everyone finished and got ready to go, it was 10:00. Everyone else was a club member, and had no particular need to climb any peak, so they wanted to do a leisurely climb of Slide. On the other hand, I was close to Panther and Balsam, both required winter peaks that I still needed (I had already climbed Slide in the winter). Although I tried, I could not convince anyone to accompany me on Panther, so I decided to climb alone. At the Panther parking lot there were two other cars, and a party of nine had signed the register before me, so I felt a little less foolhardy setting off by myself. There was snow on the ground, but it was not too deep and I could walk in bare boots, carefully. It only took a few minutes before I overtook the party of nine ahead of me -- they were moving much more slowly. Ahead, there was no visible broken trail, but it was still passable without crampons. I hurried up to the ridge, then along the ridge toward Panther. 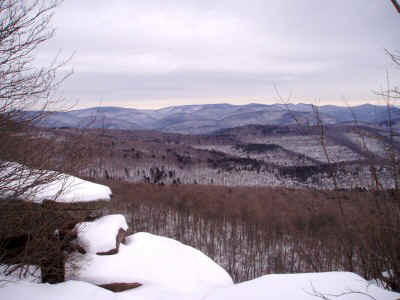 The sky was gray -- really dark gray, but the view from Giant Ledge was good. How cold everything looked! In the other direction, the clouds seemed to be gathering. 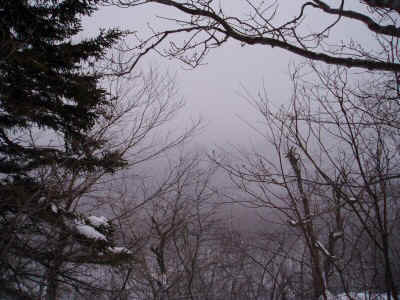 As I continued down, then up, they turned white, then enveloped me in snow. I was now passing 35,000 feet, but the snow and wind really picked up, freezing on my glasses, and made it harder and harder to walk without slipping. At my turn around time of 12:00 I decided that it would be foolish to push on alone, and that I should turn back. The snowfall and wind continued to increase, and I hurried back, now aided by my own footsteps. As I reached Giant Ledge I met again with the other party, which was just turning back itself. As I hurried back, it made me feel a little more secure that there was someone else coming along behind, so that if anything happened to me there would be help. Back at Alpine Inn, I had a pleasant afternoon visiting with other club members, sitting in on a board meeting, playing with the Inn's golden retrievers, and sitting by the fire. As the storm continued outside, I was glad that I was not in a tent, but rather in a warm room with a soft bed. The next morning saw a repeat of the leisurely breakfast, and again we did not get ready to embark until 10:00. The snow was just tapering off, with about two feet of fine dry powder on top of the previous packed snow. This time the group elected to climb Panther, although I knew we would not have the time to climb to the peak this afternoon. The parking area had not been plowed, so the first ting we had to do was to dig out a place to pull off the road. 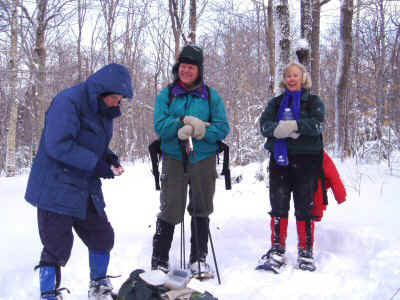 At the trailhead getting ready to go: Bernard, Art, Carol, and Dave. On the trail we traded turns breaking trail, making it up to the ridge in just under an hour. We stopped to take a rest and have a bite for lunch. We were all surprised to see a family on snowshoes come up the trail and proceed on toward Panther. They quickly found out that the going on would be much harder than following us. Although I did not make it up Panther on either attempt, the experience was special. I was lucky to see the expanse of frozen landscape under threatening skies, to experience the increasing fury of the storm as I raced back to safety, and to contemplate the beauty of the result after it was over.